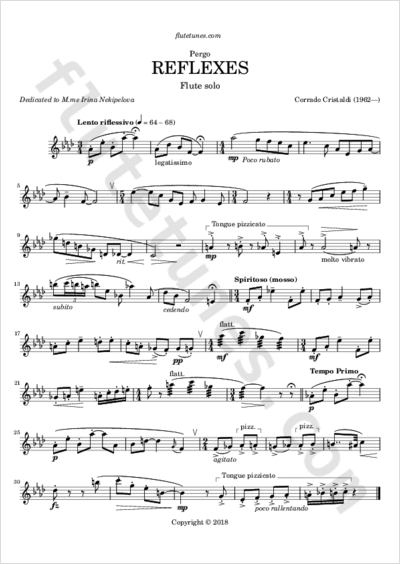 This flute solo was kindly contributed to our collection by its composer, Corrado Cristaldi from Italy. “Reflexes” is a piece that recalls the sensations perceived by observing the encounter of light with the surface of the water moved by the current. Freely inspired by the mythical Lake Pergo, a pleasant place where, for the ancient Mediterranean peoples, the rapture of Persephone (Kore) was consummated. The Seasons were born here. Technically the piece is a short and witty study in which the new techniques of sound production and the attention placed on the phrasing emphasize the expressive value of simple melodies in search of the point of balance.